April 1st. The day that pranksters rejoice at the opportunity to be a tad mischievous and are absolved of all punishment under the guise of April Fool’s Day. The goal is to fool an unwitting victim into believing something or trick them into taking some sort of action you’ve encouraged them to. Growing up in my household, we would be awoken by my father with the news that there had been a big snow storm overnight and that school was cancelled. Much rejoicing followed until we rushed to the window to see how much snow we’d be able to go out and play in with a day off from school – only to see bare ground. Somehow in the year between we always seemed to forget his go-to prank. Whatever the hoax might be, it is meant to be received in a humorous way. To tease or get a bit of revenge but always to surprise someone when they learn the truth about a situation they have been enticed into believing. However, there’s one prevalent hoax (especially since the invention and widespread use of Facebook) that many will resort to on April Fool’s Day. It isn’t funny and I’m about to share with you just why I urge you to never have this in your arsenal of pranks. Fake pregnancy announcements, while they may seem harmless and all in good fun for you, can be extremely hurtful for others who are struggling with infertility or pregnancy loss. They hurt for the couple who wants nothing more than to get a positive pregnancy test result. The couples who have been trying to get pregnant for YEARS while everyone around them seems to be able to have children without even thinking about it. They hurt for the couple who has been dealing with secondary infertility. They are so tired of being asked when they’re going to give their child a sibling because people assume you can have another child without difficulty. They hurt for those who have suffered miscarriages, late losses or stillbirths. They’ve had their hopes and dreams and children torn from them. You might rationalize the announcement as being all in good fun. You reason that you would never mean to intentionally hurt someone. You’re only doing it because you know there’s nobody in your circle of friends or family who have problems getting or staying pregnant. Just because you haven’t been told about someone’s personal struggles with pregnancy does not mean they have not happened or are happening in their lives. To think otherwise is extremely naive. The harsh reality is that many people who are challenged with infertility or have suffered losses never talk about them openly. They grieve privately, sometimes only sharing that grief with their spouse. It is for this simple reason that I ask you to please not let false pregnancy announcements pass over your lips or through your finger tips. Not only today but every day. What may seem like a harmless joke to you can cause unimaginable wounds to reopen for those you love the most, without even realizing your words are having that impact. By all means, have fun and celebrate April Fool’s Day but beware of the impact your antics might have on others. 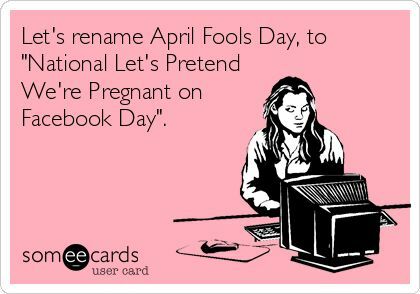 I remember all the fall out last year from fake pregnancy announcements on Facebook on April 1. Some things just aren’t “funny”. Tammy, do you mind if I pin your blog on Pinterest as one of my favs? Not at all Donna. The more people that are aware, the less chance is of those they love getting hurt by the seemingly harmless joke. Ahh Tammi, thank you for this post. So well written as always. As an IF, I find that almost all pregnancy announcements sting a bit, but as you said, the ones made in jest sting the most. That CS Lewis quote is a new favorite too. So bang on. You are most welcome. I know they will always sting – even if legitimate, but know that it is only multiplied when falsified. THANK YOU Tammi! No truer words spoken/written! Did you stop writing Tammi? It doesn’t hurt me this year. Although, I am rolling my eyes at all the April Fools stuff going on. I’d rather not spend my entire day skeptical thank you very much. Two years ago, these April Fools announcements were really hard for me. In fact, I think if I’m not mistaken, I held off announcing a pregnancy because it was April Fools and I didn’t want people to not believe me. I had lost one baby a few months before and was about 6 weeks pregnant with another. I was feeling raw and hopeful. Unfortunately, I lost that baby a couple weeks later. I can see the fun in these announcements and even laughed and laughed at one my sister did when she pushed out her belly so much that she seriously LOOKED pregnant. But I think the post is good to remind people that we don’t always realize how much our funny actions can hurt those we’d never expect. Thank you for this post. I had not thought of this before. Having made a post that suggest my wife and I were expecting I now see how that could have been hurtful. If nothing else you have one convert to no fake pragancy facebook posts.